iOrganize is the perfect application to store all the notes, ideas, text extracts, web links... you find while working daily, but without knowing exactly what to do with them. Thanks to its great user interface, iOrganize lets you quickly and easily store what you want. Advanced users can take advantage of advanced features such as the services menu or the dock menu to quickly create new notes. Its powerful search functions let you retrieve nearly instantly what you were looking for, even months after storing it. Best idea and note organizer out there. Very comfortable interface. Intuitive, handsome, useful and suave. 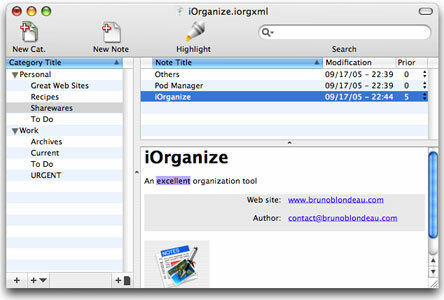 iOrganize is undoubtedly the very best note cataloging program on the market... I know... I have tried them all! I have even paid for most of them. I have many many big documents categorized in iOrganize, and it never gives me one minute of trouble. Bruno does an excellent job with continuing to develop the program. Thanks Bruno! The BEST notepad available -- I wish I wrote it. The program is a great replacement for all those little scraps of paper I've had on my desk most of my life. My wife thanks you too! She has always hated the mess. The effort and support of authors like Bruno is what makes our platform so unique and enjoyable to be a part of. No program can be all things to all users but iOrganize is the best in class for users who need to save and find snipets from various sources. Own it, love it, couldn't be without it. Just love it. Simple. Elegant. Simply the best app. in it's category ! Absolutely indispensable. Fine app, one of the best, if not the best, idea organizers that I have ever seen in 20 years of computing. Simple, stable, intuitive, the type of app that keeps me using the Mac. The author has written a gem, well worth trying if you work in a field where you need to organize large amounts of disparate data. Almost seems like a natural extension of Apple's core i products. It's that good! This is what I've needed all my life, I keep spreading random ideas and links all over the place. You've done a fantastic job with it; especially keeping everything simple. This little gem is already one of the most frequently used productivity tool on my computer. Download this file to freely test iOrganize. It can also be used as an updater for registered users.